If you're new to Tiller and coming from YNAB you can use these steps to help you migrate your existing data. Video tutorial at the bottom. Export your data from YNAB. You can do this by clicking on “My Budget” in the top left and then choosing Export Budget. This will export a zip file that contains two CSVs: one for your budget and one for your register. Once those are downloaded onto your computer open your Google Drive at https://drive.google.com and drag and drop the two CSV files from the YNAB export into your drive. The next step is reorganizing the YNAB budget CSV to match the Tiller Budget Categories sheet. 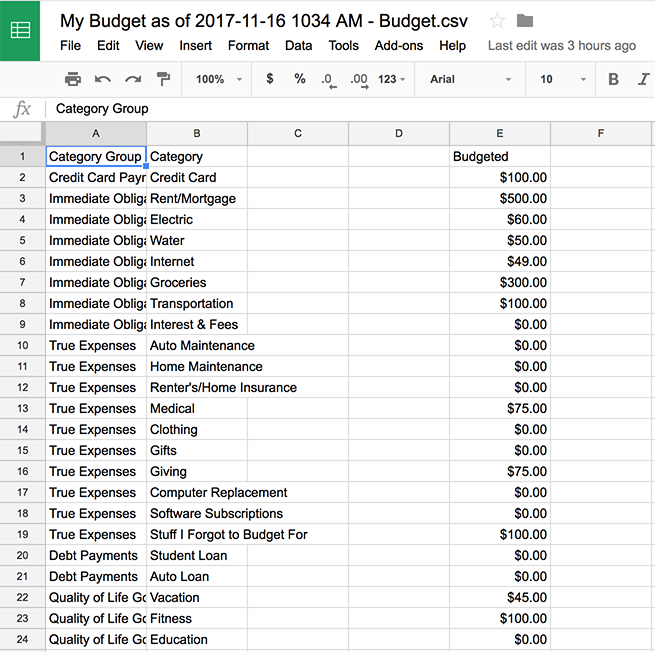 In your Google Drive double click the “My Budget as of [date] - Budget.csv file and then click the “Open with Google Sheets” button at the top. Open your Tiller Budget spreadsheet from the Tiller Console and navigate to the Categories sheet (a tab along the bottom). We need to reorganize the columns in the YNAB export to match this layout in the Tiller Budget. The column order we need to match is Group, Category, Type, Hide from reports, Budget. In the YNAB budget CSV delete all the rows of data for past months. You can click the row number, scroll down, hold shift and click the last row number for lines for prior months. Then right click and choose to delete the rows. These are still in the original CSV file if you want to add historical budget data to Tiller later. Now let’s get rid of some columns we don’t need. Delete the columns for Month and Category Group/Category. Click the column header letter for the Budgeted column (column C) and then hover until a small hand icon appears. Click and drag the column over to Column E position. Finally, click the column header letter for “Activity” (column C), hold shift and click the column header letter for “Available” (Column D) to select all the data in these columns. Press the delete key to clear the data. Now we’re ready to move this over to the Categories sheet in our Tiller Budget spreadsheet. Select row 2 in the YNAB budget export, hold the shift key and select the last row for budget items. Right click and choose copy or use CTRL + C (Windows) or CMD + C (Mac). 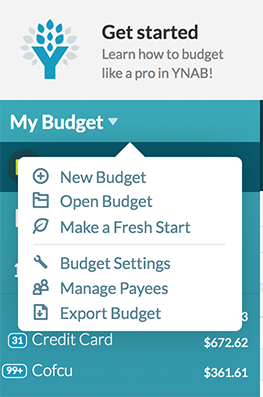 Navigate to your Tiller Budget spreadsheet and then right click cell A2 and choose Paste Special and then “Paste values only.” Now you have your YNAB budget in your Tiller Budget Categories sheet. Finally, you’ll need to update the type for each of the categories. Most of the ones from YNAB are likely Expense types and the last one for income should be set as an Income type. You can choose whether you want to hide any of these from your Budget dashboard if you don’t have that expense this month. Now it’s time to format the register export from YNAB to match your Tiller Transactions sheet. The process is somewhat similar to steps for getting your YNAB Budget into your Tiller spreadsheet. We need to move around some columns, delete others and generate the amounts to match Tiller’s formats. Right click the Transactions sheet and choose “Duplicate.” We want to create a backup of the Transactions brought in by Tiller so we can reference it later. On the Transactions sheet (not the copy we just made) select row 2 by the row number, scroll down, hold the shift key and select the last row number for your last transaction. Press the delete key to clear the data. 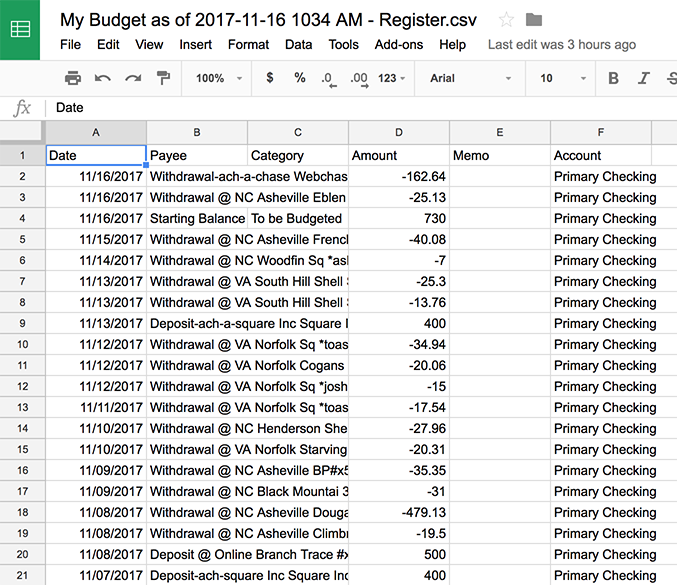 Open the YNAB export CSV as a Google Sheet in your Google Drive and compare the data in the account name column to the Account name data that’s listed in the copy of your Tiller Transactions sheet. If the names are different you’ll want to update the account names in your YNAB export to match the account names brought in by Tiller. You can quickly do this by sorting the YNAB sheet by account name and then use the quick fill method to update the names. Next we’ll reorder the columns in the YNAB export to match the Tiller Transactions sheet. The column order should be Date, Description, Category, Amount, Note, Account. Let’s first start with Date, Description, and Category. Move the date column in the YNAB export Google Sheet to the column A position. (remember: click the column letter and then hover your mouse to show the grabber hand, click, and drag.) Then move the Payee column (description) to the Column B position. Move the Category column to Column C position. Now we need to format the Amount data to match Tiller’s format. Insert two columns to the right of the Category column. Right click the column header letter for the Category column and choose Insert 1 right. Name this Amount. Insert another column to the right of the Amount column and name this one Amount Calc. In the first cell in the Amount Calc column insert the following formula =I2-H2 This is subtracting the inflow from the outflow to create amount values that match Tiller’s formats. Use the quick fill method to fill the other transaction amounts using this formula. Now we need to get just the amount data into the amount column without the formula. Select all the amounts in the Amount Calc column and then right click to copy. Select the first empty cell in the Amount column, right click and then choose Paste Special > Paste Values Only. Now delete the Amount Calc, Inflow, Outflow, and Cleared columns. Move the memo column to the left of the Account Name column. Now we’re ready to move our data to the Transactions sheet in our Tiller spreadsheet. Select the row number for row 2, scroll down, hold shift and select the row number for the last transaction. Right click and choose “Copy”. Head over to your Transactions sheet in your Tiller spreadsheet and select cell A1 and then right click. Choose Paste Special then choose “Paste Values Only” to paste in your transaction data. From here you can clean up your data using the copy of your Transactions sheet. You can copy over the account number and institutions from the copy to the newly pasted transactions. If the Copy of Transactions has data that’s more recent you can move those over too by inserting rows at the top first and then pasting them in, or you can add them to the bottom of the transactions sheet and then re-sort the sheet by date. Delete the Copy of Transactions when you don't need it for reference anymore. Now when you open the Budget sheet you should get an idea of your budget progress for the current month or period. Be sure to double check the period start date and set your desired budgeting time period at the top. You can customize your Groups and Categories on the Categories sheet and update your planned budget for each category on the Budget sheet using the New Plan cell. Review our getting started steps for the Tiller Budget template for more on how to get started. If you’d like to re-think your category schema and you’re transactions are already categorized reach out to us at support@tillerhq.com for information about our AutoCat Google Sheets Add-on for quick and automatic categorizing.